A book review of The Language Police. Can you imagine reading a book that never uses the words "man," "founding fathers," "blind person," "bus boy," or "Adam and Eve?" Instead books would have to read: Eve and Adam because it's sexist to say a man's name first, and we should refrain from saying bus boy for the same reason thus the word dining room attendant should be used instead. 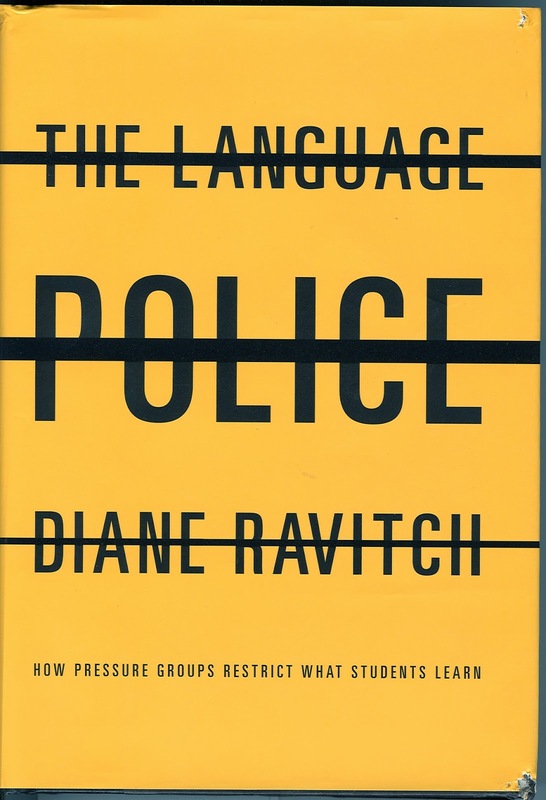 Diane Ravitch, author of The Language Police, has exposed America's bowlderized text book industry beginning with her own experience growing up in the 1950's where text books were scrutinized for being socialist or offending conservatives. Then she delves into the panels of trained bias detectors in the 1970's where they conducted Differential Item Functioning (DIF) to delete test items that were biased based on how different demographics scored. If Caucasians or Latinos happened to perform poorly on a question it was blamed on their socio-economic or sociocultural characteristics and the question was deleted. For centuries America's textbooks in all disciplines have undergone extreme slandering of original material that in many cases has lead to inaccurate information, bland text, dumbed down materials,and angry authors (of those still living). Ravitch's book informs readers about the history of censorship regimes that have been employed by the government, major publishers, and test companies. How can the language police be stopped? Ravitch argues that "the only strategy to achieve this goal is through competition, sunshine, and educated teachers (pg. 165)." The state-wide adoption process needs to end. States and publishers must publish their bias guidelines and sensitivity review panels along with their curricula vitaes. Any questions or items that are removed or altered need to be released to the public with explanations. Finally, teachers need to be educated instead of relying on textbooks as a crutch. These teachers will reject textbooks that have errors, are bland, are misleading, or are politicized and will make educated decisions about what kinds of readings are acceptable for their students needs. "In a perfect world, teachers would be so well educated that they wouldn't rely on textbooks" (pg. 169)." I can personally attest to the importance of this quote as I see textbooks as a supplement or as organizational help to my courses in ESL. Whatever information is in my ESL or writing textbooks I can easily adapt or create my own version to better suit my students interests and my own personal teaching style. Why not record your own voice for listening materials and tests? Make your materials interesting and fresh instead of another rote activity? We should be teaching topics that are controversial and let students explore discussion and communication skills that they will encounter on a daily basis outside of the classroom. Teachers should not avoid controversial topics like text book publishers do. Their idea of utopia inside the classroom should not become your own because you have enough common sense and teaching skills to reign students in and avoid problems when learning about or discussing such controversial topics. One of my co-workers gave an amazing presentation in support of using "controversial" topics in classrooms specifically to avoid the boring textbooks and sleeping students she commonly encountered. There is nothing wrong with doing it as long as a teacher has an exit plan and an organized, collaborative, and open environment where freedom of ideas are encouraged. I hope you enjoy reading Ravitch's book and if you are a teacher don't get disinterested with it because of the common struggles we face. You may be asking the question "Well what teacher has the time to worry about creating authentic materials or notice errors in textbooks?" Supplementing and changing textbooks won't happen over night, but over a slow process of informed and contemplative decision making starting from the bottom, us. Great book and yes great article about this book. I just love these types of books and looking forward to your future posts. Keep posting and sharing.